20 year-old Kirstie Gordon is a surprise inclusion in the England Women's T20 World Cup squad. The left-arm spinner caught the eyes of the England selectors during this season's Super League where she was the tournament's leading wicket taker with 17 victims, helping her Loughborough Lightning side reach the final. Born in Aberdeen, Kirstie made her debut for Scotland as a 14 year-old against Gloucestershire in 2012, going on to play 59 times for her country. She represented Scotland in the 50-over and T20 World Cup qualifiers, but is eligible to play for England straight away as none of Scotland's matches were ODI's or T20I's. Her best bowling return of 4 for 29 came against Pakistan in Colombo during last year's qualifiers. "I’m delighted and shocked to be included in the World T20 squad," Gordon told CricketEurope after the squad was announced. "After the KSL I got a phone call from Mark Robinson to join up with the England squad and train over the few weeks before the World T20. "I never ever expected I would be getting on the plane - I was just delighted to get the opportunity to train with them." 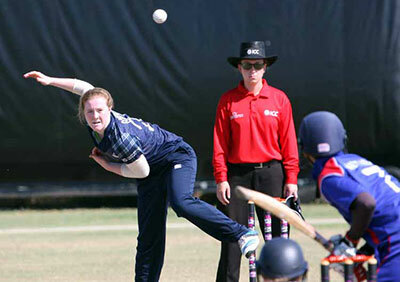 She paid tribute to Cricket Scotland for all their help and support during her six years with the team. "Cricket Scotland have been so supportive in assisting me in following my dreams to try and play cricket at the highest level and I’m really grateful for that. It's been a real whirlwind for Gordon, who has shocked herself with her rapid rise to the biggest stage in world cricket. "When I signed for Loughborough Lightning I didn’t even know if I would make the starting 11 so to have this news now is incredible! "I’m so excited to get out there and hopefully play my part in a successful campaign."